I was thrilled this week to be asked by the Ham & High newspaper to write a piece of hints and ideas for Fireworks Night and Halloween fun. But, woe is me, I ran out of words before being able to tackle the burning issues of bonfires! So here, by way of small comfort to myself if no one else, is some brief guidance on a simple approach to backyard bonfiring. It seems to me that far too many folk these days are afraid of bonfires, thinking them complicated, destructive and super-dangerous. But hey, relax, here’s how to keep your cool even whilst the flames are flickering. 1) Find a location. Most parks or public open space don’t allow fires, so you will need to either use your garden or arrange a communal event (such a heartwarming experience), for example by holding your bonfire as a special event at a school or block of flats. 2) Wherever you choose, there must be no overhanging trees or plants within reach of the flames. 3) Hardware stores sell amazing bonfire bins (metal rubbish bins with holes in all the right places for controlled fires) … get one! Now! Run! 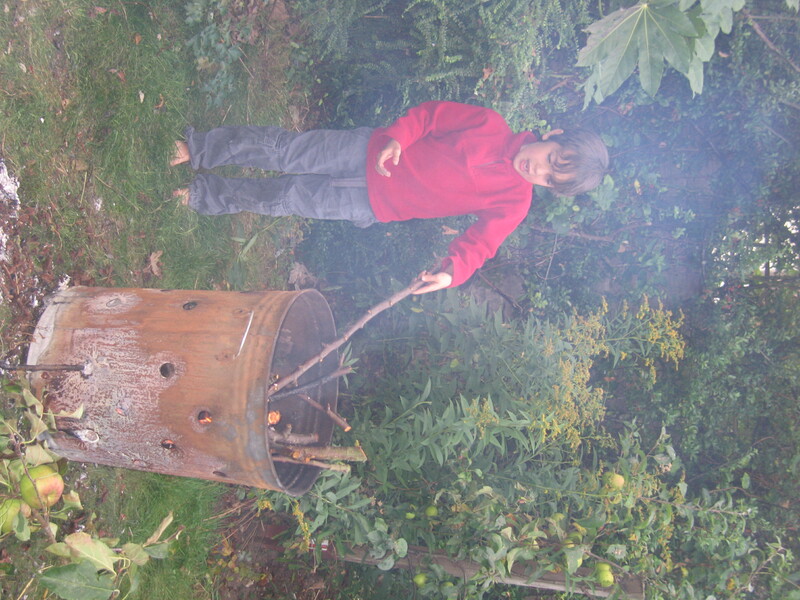 4) A little forward planning – hunt down a pile of wood of different sizes and types, from biggish logs to teeny twigs. (Use untreated wood so as to avoid chemical fumes – furniture will not do.) Not all of us have large country estates with unlimited supplies of timber, so alternative hunting grounds are local authority parks departments, skips, and friendly tree surgeons. 5) This is a good time to get a bucket of water ready. 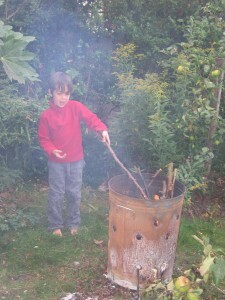 6) Gather together a few balls of scrumpled paper at the bottom of the bin and place a little pyramid of twigs on top. Without burning your fingers (THIS IS NOT A JOB FOR CHILDREN), squeeze a lit match through any gap in the twigs so that the paper catches light. Marshmallows: After 20 minutes or so the fire should be at full force and ready for marshmallows! You will need a longish stick with a pointy end. Stick the marshmallow onto the point and hold it for a couple of minutes in the fire, just above the flames, until it is slightly browned but hopefully not burnt to a crisp. Savour the yum, but don’t forget it’ll be hot (ouchy tongues!). PS. Never ever leave a fire burning, especially in an urban area … this is why you got a bucket of water ready! This entry was posted in Uncategorized and tagged bonfire, communal event, fireworks night, marshmallow, twigs. Bookmark the permalink. What an interesting and unique website. There are some really great ideas on here. Fab.